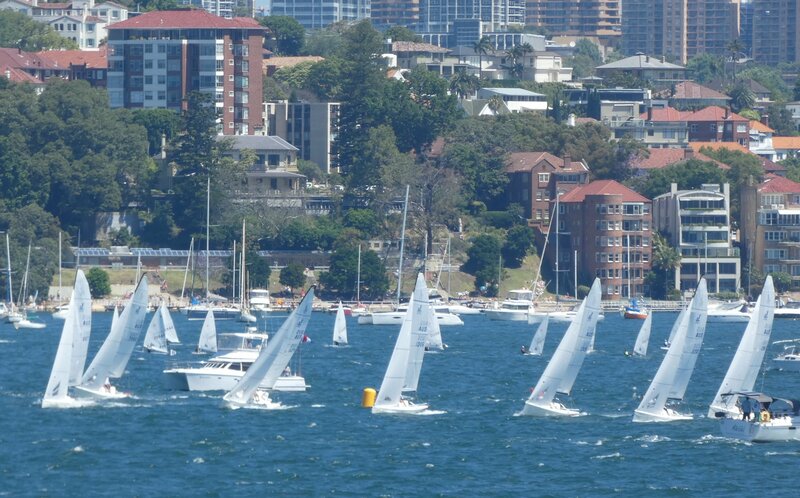 (Sydney Harbour, NSW, Australia)- The New South Wales J/70 State Championship regatta was held in glorious warm weather on the first weekend of March on Sydney Harbour. Racing was held at the entrance of Sydney Harbour, so the Pacific swell became a factor along with a flood tide and the occasional passing ferry during the next two races. This was the first regatta held by the Australian J/70 Class Association after a great effort by J/70 racers and lawyers Peter Ryan and Adrian Kiely, and others that led to official recognition by Yachting Australia. The racing was closer than in previous years, with at lot of congestion at the turning marks and many new hot shots from the Olympic classes making an appearance. Racing was delayed on the first day while the PRO waited for the sea breeze to settle after swinging through 30 degree shifts either side of ENE at 6-10 knots. After the delayed start, the major shifts returned and boats that correctly picked the right side of the course opened large leads, with Tim Ryan and his team on JAMES 007 winning race 1. Races 2 and 3 were both won by ex-Etchells and America’s Cup sailor Jervis Tilly and his team on JACKAL from Royal Sydney Yacht Squadron. On Sunday, the crews enjoyed the forecasted slight increase in pressure to steadier ENE 10-15 knots. With two wins and a second place, JACKAL had a strong lead after day one. Australian J/70 class President Andrew Thompson and his JABBERWOCKY team, representing the host club of Middle Harbour Yacht Club, showed great speed to win race four. With the sea breeze strengthening for the final race, Reg Lord and youth match racer Tom Grimes with new crew George Richardson and Mitchell Evans on JUNO found the groove and won the final race after placing second in the previous four races. After a visit to the protest room regarding rule C3.1(c), the final results were the Cruising Yacht Club of Australia’s JUNO and JAMES 007 in first and second for the second consecutive year. Then, JABBERWOCKY placed third, just ahead of JACKAL in fourth. Finally, rounding out the top five was Paul Breslin’s fast improving MADNESS in fifth. Add to Flipboard Magazine.